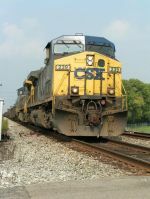 Description: CSXT 239 is seen on a WB mty hopper train at Keyser, WV. Description: CSX 239 is on the point of Q-409 as it is about to enter the north portal of the tunnel at West Point, NY 4/2000. Description: S/B K517 counterpart was our last catch! Description: A loaded Stilesboro coal train passes Wyvern Yard. An empty Stilesboro train and another empty coal train were waiting in the siding for this train to pass. Description: A loaded Stilesboro coal train heads for Plant Bowen. Description: Bringing a coal drag down the Cheat River grade. Description: Bringing a coal drag down the Cheat River grade. The asphalt pad next to the loco used to be the Rowlesburg station platform. In another couple of hundred yards, the 5016 and its train will cross the Cheat River on Bridge 92. Description: Sorry for the bad photo! Description: CSXT 4601 leads a loaded stone train en route to Grand Rapids. Description: Chatham Station now part of Kinderhook Bank. Description: CSX AC44CW 239 trails on R64731 South.